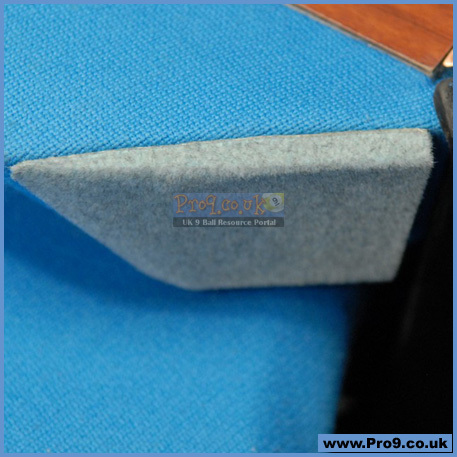 These uniquely designed ProPockets are easily stuck to the jaws of the cushion with tape and simply removed, leaving no damage to the cloth or table. ProPockets react the same as if the shim was under the cloth due to the coating of nylon fibres. Fits all US style pool tables. 1 colour available, 4 middle pieces, 8 corner pieces. 3 sheets of double-sided tape included, ready cut and ready to use. The size of the pockets on tables varies in size and there can be a small difference from table to table. 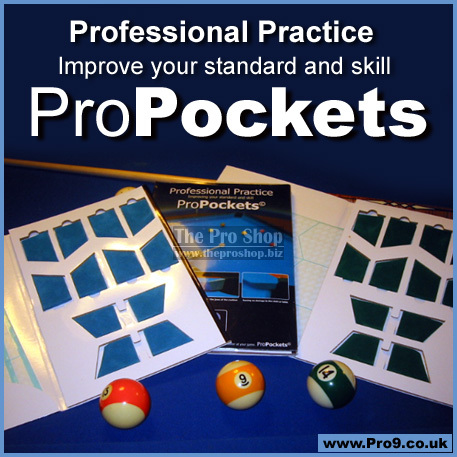 ProPockets were designed for a practice aid and has taken an average thickness as its measure to determine the degree of difficulty it wishes to achieve. ProPockets have been tested to reduce the width of the pockets by up to 18mm, effectively 9mm on each side of the pocket. 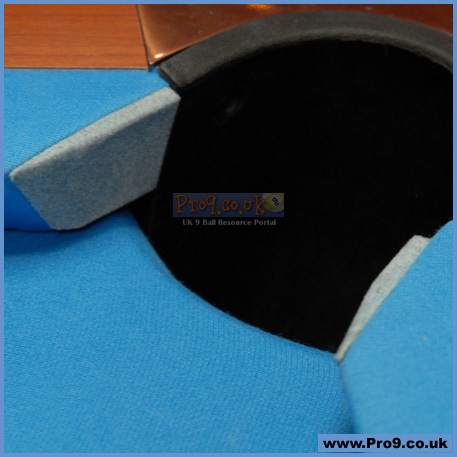 ProPockets also fit the 7 & 8ft American pool tables with a small adjustment. Once you receive your ProPockets set, attach to each piece the double sided tape provided and place back in the folder, they will stay in place until you are ready to use them and because of the type of backing in the folder inlets, no stickiness is lost. 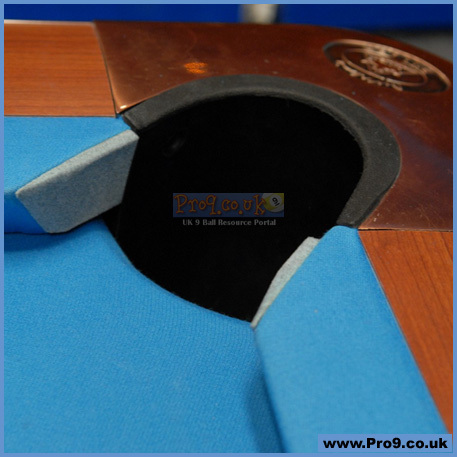 Each table is different when it comes to the angle of the pockets, some fitters pull the cloth too much so it rounds the point of the corner; try to place the ProPockets where it suits your pocket cut. Press firmly in to place on the inside of the cushion; there are 4 smaller pieces for the middle pockets and 8 larger for the corners. When you have finished playing, place the ProPockets back in the folder ready for next time. Only change the tape on the ones that need changing as each piece will have a different lifespan as to when the stickiness of the tape has gone. Available in blue or green - and now with FREE worldwide shipping!